More longtime immigrants seek sanctuary rather than leaving U.S. kids behind or forcing them to live in unstable countries. Just nine miles north of the White House, the immigrant mom of three children took a dramatic step as the holiday season approached in December. Leaving her children behind in Fredericksburg, Virginia, Rosa Gutierrez Lopez sought protection from a Bethesda, Maryland, house of worship to avoid deportation by U.S. Immigration and Customs Enforcement, or ICE. Gutierrez Lopez, 40, is now in her second month inside the Cedar Lane Unitarian Universalist Church; she sees her U.S. citizen children on weekends while she resides in sanctuary. She has an 11-year-old daughter, and two sons, ages 9 and 6. Her youngest son, who has Down syndrome, is in the care of his father, from whom Gutierrez Lopez is separated. Her older kids are in the care of a pastor in Fredericksburg, where the children were born. 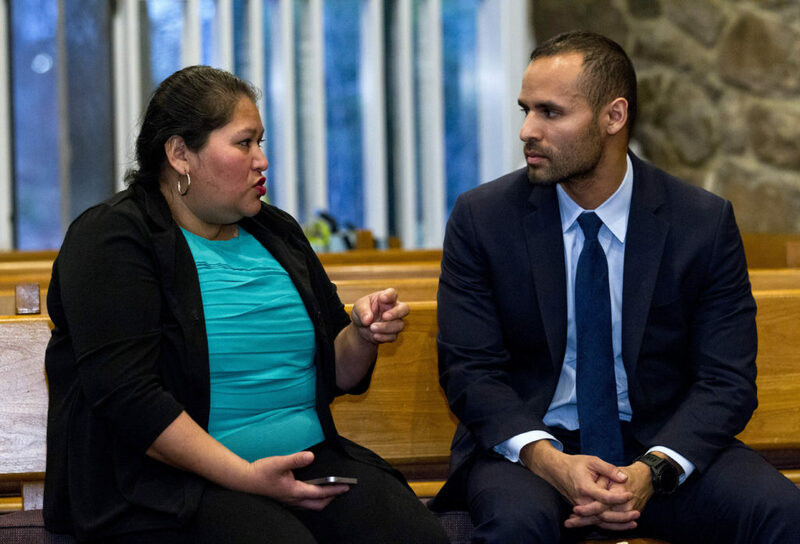 “I did not want to leave my children behind,” Gutierrez Lopez told worshipers during an event last Dec. 12 at the Cedar Lane church, where she publicly explained her decision to defy an ICE order that she self-deport back to El Salvador by Dec. 10. Inside the church, the immigrant mom — who left El Salvador more than 13 years ago — is still wearing the tracking ankle bracelet that U.S. Immigration and Customs Enforcement officers in Richmond, Virginia, placed on her last October. While she hides out, Gutierrez Lopez said, a lawyer she’s retained is trying to re-open a bid for asylum that she first filed back in 2005, without representation by an attorney. Her case, Gutierrez Lopez said she later found out, was closed and she was issued a deportation order because in 2006 she failed to appear at an immigration court hearing that she said she didn’t know had been scheduled. After she discovered that a deportation order was hanging over her head, Gutierrez Lopez said, she tried to rectify her mistake and was able obtain reprieves from deportation in Virginia, where she had moved. But everything changed after President Donald J. Trump took office, and Gutierrez Lopez found herself facing a stark choice: She’d have to permanently leave her children in the United States or take them to a country where she feared they’d struggle to survive and stay safe. That’s when she sought sanctuary, which has become a tradition for immigrants like Gutierrez Lopez. In the 1980s, churches began publicly offering hiding places for undocumented Central Americans fleeing Cold War-era civil wars. Many El Salvadorans sought refuge in churches in that era because they found little success in seeking asylum in immigration court; the United States considered El Salvador an ally at the time and supported regimes with military hardware. Asylum applicants must prove in immigration court that they face threats to life and persecution in home countries, based on political affiliation, religion, ethnicity or national origin or because they’re part of a threatened social group. In 2011, the administration of former President Barack Obama issued a memo clarifying that “sensitive locations” like churches were off-limits to ICE officers seeking to make arrests of undocumented immigrants, along with schools, hospitals, funerals, weddings and public demonstrations. Officers could still conduct some investigative actions, such as records checks, and could also enter in the event of a national security threat or imminent danger. Despite some enforcement that seems to have violated the “sensitive locations” spirit, the memo officially remains in place under Trump, according to ICE. Today, though, with Trump’s tough approach to immigration, immigrants are once again facing deportation back to countries where they say they face unstable, even life-threatening conditions. More potential deportees have been here long enough to have U.S.-born children now — as Gutierrez Lopez does — and American churches are stepping up once again to provide the immigrants with refuge. So far, there’s no official government count of sanctuary seekers in the nation’s churches. But an organization called sanctuarynotdeportation.org is tracking how many immigrants could be hiding out among the 1,000 houses of worship in its network. The group estimates that within the last four years, 57 people have publicly announced that they were hiding out in one of the houses of worship in its network. Of those 57 people, 37 have publicly turned to congregations in the network for protection since Trump took office. “This is making it real, to have someone like Rosa, who we are getting to know as a real person, facing such huge challenges and displaying such immense courage and grace in the midst of all those challenges,” Abhi Janamanchi, senior minister at the Cedar Lane church, told the Center for Public Integrity. When Gutierrez Lopez fled El Salvador in 2005, she turned herself over to Customs and Border Protection agents at the U.S.-Mexico border, according to her current lawyer, Hector Perez-Casillas, managing attorney for the Falls Church, Virginia office of the New Jersey-based Romero Firm. She originally sought asylum because she said men had threatened her and her family in El Salvador with machetes. ICE granted Gutierrez Lopez two reprieves from deportation in 2015 and 2016, and she also complied with mandatory regular check-ins with ICE officers. Since she had no criminal record and had developed roots in the United States, she was not considered a priority for deportation under former President Barack Obama’s so-called “prosecutorial discretion” policy, which made it a priority to focus on deporting those who had committed serious crimes. Federal officials have long had leeway to set priorities for deportations, but Obama’s policies drew criticism. And in 2017, with Trump assuming the presidency, immigration enforcement officers were urged to expand crackdowns that could target anyone under a deportation order. ICE officers in Richmond, Virginia, placed an ankle monitor on Gutierrez Lopez during Trump’s first year in office and ramped up her check-ins to every two weeks. Then in October of last year, officers told Gutierrez Lopez that she should prepare to self-deport by Dec. 10. With tears in her eyes, Gutierrez Lopez described buying a plane ticket, which she says ICE officers “pressured” her to do. 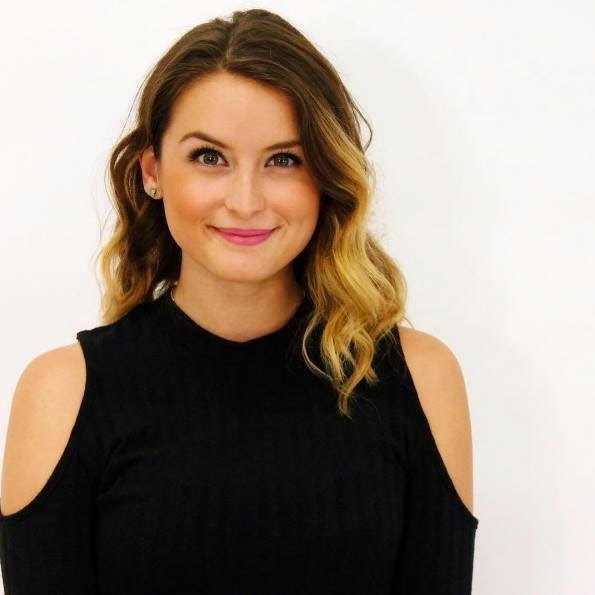 She went to the airport the day of her flight but couldn’t go through with boarding. For now, a church seems to be the safest place Gutierrez Lopez could hide. Since Trump took office, though, criticism has erupted over ICE officers entering courthouses and carrying out immigration arrests near schools. In one case, U.S. Customs and Border Protection agents followed an undocumented 10-year-old with cerebral palsy as she was transported to a Texas hospital. The agents detained the child after waiting at the hospital while she had emergency gallbladder surgery. Subscribe to the Watchdog newsletter to get our latest updates delivered to your inbox. In Bethesda, Gutierrez Lopez is the first immigrant the Cedar Lane church has taken in to prevent a deportation. Activists with the DMV Sanctuary Congregation Network, a group supporting sanctuary for immigrants, believe she is also the first immigrant to seek such refuge under Trump in the greater Washington, D.C., metropolitan area, which includes parts of Maryland and Virginia. When Gutierrez Lopez went public with her decision, clergy of various faiths appeared at Cedar Lane with her to show their support. Trump has received support from conservative evangelical communities, but the pastors who gathered at Cedar Lane said they couldn’t see how deporting someone like Gutierrez Lopez made sense as a way to address the complex issue of migration. Trump has opined repeatedly that he thinks asylum applicants from Central America are mostly undeserving. But U.S. State Department reports do identify El Salvador and Honduras as home to some of the highest homicide rates in the world. Those nations also suffer from gangs engaging in widespread threats and shakedowns. Perez-Casillas, who took over her case recently, filed a motion late last year to revive her asylum case and rescind the deportation order. He said that he’s discovered evidence that her family in El Salvador has endured a history of violent threats. There’s no answer yet on the motion from the immigration court in Texas. Cedar Lane, Janamanchi said, will shelter the immigrant mom “while she awaits resolution.” He said that the congregation is working with her on ways for her to earn an income. Araceli Velasquez, who fled El Salvador in 2010 and arrived at the U.S.-Mexico border seeking asylum, was put into detention for more than a month, The Denver Post reported. After her release, she moved to Colorado and met and married her husband, who is currently covered by Temporary Protected Status, a quasi-legal status that shields immigrants who happen to be in the United States when a disaster strikes their home countries. Velasquez and her husband now have three-U.S. citizen children. 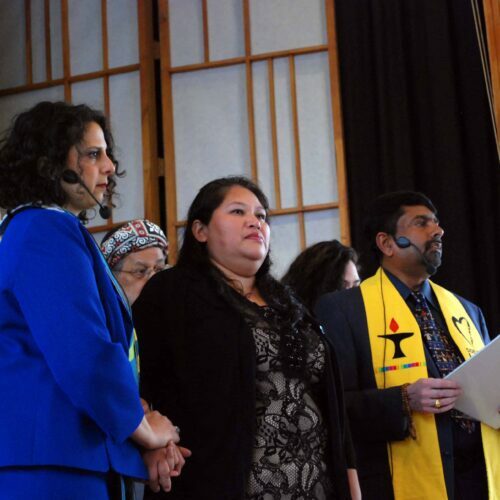 After her asylum claim was denied and her stay of deportation expired, Velasquez sought protection with Park Hill United Methodist Church and Temple Micah, two houses of worship in Denver that share a building. She’s been inside the property for more than a year. Alex Garcia, 37, a native of Honduras, who’s been in sanctuary for more than a year in Christ Church in Maplewood, Missouri. Married to a U.S. citizen and father to three U.S.- citizen children, Garcia is a construction worker who has been in the United States for more than a decade. He was spared deportation in 2015 and 2016, but in 2017 he was told to self-deport from the United States. Instead, he sought sanctuary because he was worried about what would happen to his U.S. citizen spouse and his children, one of whom is diagnosed as having Asperger’s. Susan Ferriss contributed to this report. Trump justifies shutdown, wall by bashing immigrants’ role in economy. What’s true? Do undocumented people benefit the U.S. economy? Here’s what the research shows. What gives any foreign national the right to break the laws on the United States? Rosa Gutierrez Lopez needs to be arrested and deported and the churches that are providing sanctuary should lose their tax exempt status. The point at which wine is changed to water is approaching: America’s social fabric is being torn apart by urban decay, endemic crime, massive substance abuse, and structural welfare dependence. These escalating problems are intimately related to the rapid changes in the ethnic makeup of America, caused by decades of a de facto “open borders” policy by cynical neoliberal globalists.